If the price comes in right, I'll be able to have my quilt studio built soon. 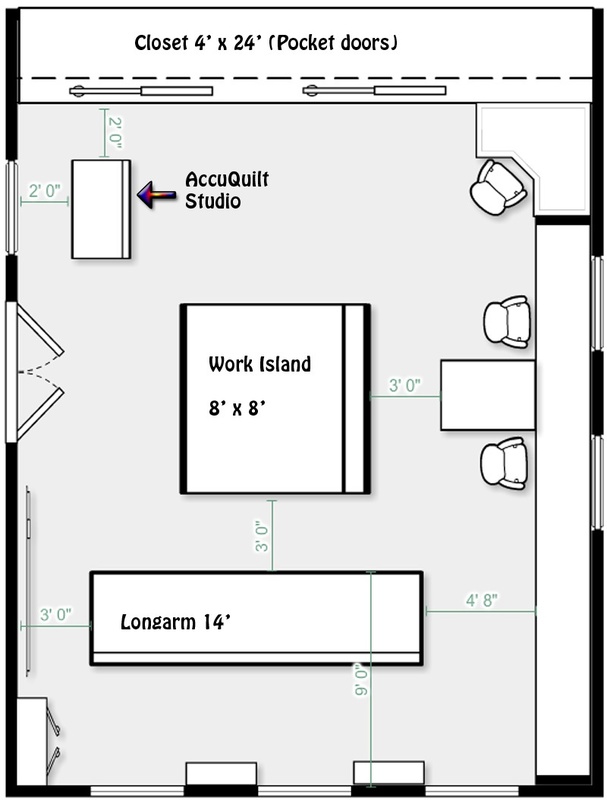 I've drawn out a plan to the best of my abilities, and would love some feedback, as I'm sure many of you have either built your own studio or dreamed of it, and will have suggestions I won't have thought of. I thought to put floor to ceiling shelves in the closet, about 2 feet deep, leaving me 2 feet in front of them to move around as there wouldn't be doors in front of the entire section. I thought I'd store my batting rolls on the far right side, where access is limited due to the computer workstation in that corner. In the very lower left corner, is an amoire, and right next to it (above in the photo) is an 8' x 8' design wall. The ironing station could perhaps be a movable piece placed on the work island. I think the rest of it is self explanatory. Oh and the 2 white boxes at the bottom between the windows are to be built in book cases. I'll put plenty of bright lighting, stationed above all the work areas, and a couple of ceiling fans. I'd like upper cabinets over the computer and sewing stations, if the budget allows. Feedback? Any and all suggestions welcomed and appreciated! Wow Great Layout. I think you have thought through everything very well. Congrats on your studio. Nice layout. Perhaps some pegboard over the workstation for small items? Pegboard would be perfect, I have a large sheet of it in my existing sewing room, thanks! You might post this in "Mission, Organization" section and get more feedback. This is where others congregate for ideas on quilt studios. Yours looks great, by the way. Congratulations and Happy Sewing! Originally Posted by Rosie the "Ripper"
Oh! Maybe the mods could move it for me please? what about a big board ironing board? a big design wall really helps too. Oh, I'm so jealous, see the green on my face!!! That looks wonderful. Love your new studio, and don't think you missed anything in your design. That looks wonderful! I covet that closet. I agree that you might enjoy visiting some of the Mission Organization posts. There was a studio design a few months ago by suziehammond that had many many good ideas (here). How long and how wide is it? I love it! My thoughts are, why go clear to the ceiling with the storage? Personally I am not that tall, and getting a ladder, step stool, chair (horrors!!) and drag it to where I want to look that high, seems rather time wasting. To me. Maybe I am missing a thought or two/ten. I have thought of using the top of cupboards-storage shelves etc, as display area. Congratulations! Looks like you've done a lot of thinking and plannings. You've got a great start. First I'd hang batting above doors to get them out of the working space. I've found that fabric on shelving is most accessable with 12" deep shelves. You have 96 sq ft for 24 linear ft of fabric storage. If you put the 24 linear ft shelving and movable design walls in front, you'd have double function for that space. My arm length and range of comfortable motion is about 24", so that 8' sq table space I couldn't reach the center. I'd make it into 2 stations, one for cutting and one for pressing. I like some things moveable so it can adapt to my needs at the time. I like storage drawers under all surfaces, my joints don't do well for getting down low to see whats in the back of cabinets. It looks great to me. You might want to make double sure that you have outlets everywhere you might want them. My sister had some built into the floor...not sure if you need to but she teaches workshops sometimes in her studio and several machines need to be plugged in at tables that she sets up. I am jealous, but it looks wonderful!! Enjoy, and I hope it happens soon. WOW! So much space. I'm having my studio done next weeek & I too also came up with my own design. But I hired a designer for advice only. We sat & talked about how the space would be used & how much surface space I wanted/needed, ironing, cutting, & quilting space I would need. Once we got that over with. She covered everything else. Someone mentioned lighting placement & fans. There's nothing more annoying than not having enuf light or having a fan blow away a pattern off of the table time & again. My designer solved all that for me & even thought of things that I hadn't, like accessible outlets, filing cabinets for paperwork, computer cables for that TV that keeps us company when we choose to live in our space, & storage, storage, storage. pace or storage for the smallest item to the largest. And of course leaving a little room for future purchases without having to remodel or make room. A good designer will more than work with you to make sure that you're happy with the finished product & will even fit in & make what you already have look like it was all part of the "new" plan. And...short or tall, (I'm short), but my designer suggested taking the cabinets for storage all the way up to the ceiling. As your skills, fabric stash, & supplies grow, you will be in need of more storage so why not prepare for it now. I use my highest areas for storing batting or hardly used items & "pretties". If storage is needed, then pretties come down, no problem. I hope this helps. Sew much fabric....sew little time. Wonderfu and congrats. I would love to see a small space for a comfy chair, small end table and lamp. there is usually some hand work on my quilts, ie whipstitching the binding in place. Two things that are a must for me would be someplace to press (good iron and board, oversized would be great) and a design wall, which I don't see in your plans. Also lighting placement is important so you're not standing in your light when you work. My dream studio is 25 x 19 with shelving along the 25 length for fabric and room for all my books, magazines, boxes of kits etc. and my large cutting table, my sewing table with extension up, a tv and possibly a longarm. All this when my ship comes in. We can dream can't we. Oh, I forgot to mention the design wall. How lucky you are-studio looks great. I noticed that your closets are 4 X 24. I have very deep shelved closets in my room as well but find that the shelves are really too deep to be as great as I had thought they would be. It is hard to access items in the back and mine are not as deep as yours. Enjoy your space! Looks like you may have some space left to use as the ideas hit you. Looks like you have a great plan. I hope you can get it built very soon. A suggestion for that wonderful closet of yours ( I have one too), I covered each door with flannel so I have 6 mini design walls in addition to the large one behind my work station. This allows me to display works in progress and frees up the wall behind me for what I happen to be working on at the time. Have fun with your room .